A world-class welcome in a world-class city. When the Canadian Pacific Railway finally reached what would become Vancouver in Winter 1887, it literally did so on the backs of Chinese immigrant laborers, who worked under hardships and racism. Many would never see their homes again, and so started their own neighborhood uphill from the railyard at Gastown. The Canadian Pacific, however, did have its sights set clearly on China, and started steamship service from Vancouver to Hong Kong by 1891 with its Empress-class liners. Canadian Pacific eventually started an airline, using YVR as its hub and stretching its wings from there to Australia, South America, Europe, and of course Asia. Chinese immigration to British Columbia continued through the 20th Century, and today about 20% of the metro Vancouver population claims Chinese heritage. Its Chinatown is second only to San Francisco. You’ll also encounter significant communities of Southeast Asian, Korean, Japanese, South Asian, and Persian origin, all coexisting among the breathtaking scenery and dynamic economy. That kind of population base, combined with significant business and higher education resources, has created an incredible demand for Transpacific flights. Air Canada is the largest carrier at YVR, with frequent nonstop or one-stop service to all major Canadian cities west of Montreal, and extensive commuter operations in B.C. and Alberta. They also fly daily nonstops to Hong Kong, Seoul-Incheon, Tokyo-Narita, Shanghai-Pudong, and Beijing, where their Star Alliance partners Asiana, ANA-All Nippon, and Air China can connect you pretty much to any destination in East or Southeast Asia. Air China also flies its own aircraft to Vancouver from Beijing, code-sharing with Air Canada. Star Alliance partner EVA Air has a daily nonstop to Taipei, Taiwan. ANA has a daily flight to Tokyo's Haneda airport. And AC's budget division, Air Canada Rouge, offers a summertime nonstop service to Osaka-Kansai. The oneworld Alliance is represented by Japan Airlines, flying daily to Tokyo, and Cathay Pacific, offering double-daily nonstops to Hong Kong. The third global alliance, SkyTeam, competes with Korean Air's daily nonstop to Seoul-Incheon, China Eastern with a daily nonstop to Shanghai-Pudong (extra frequencies added seasonally) as well as a 3-per-week nonstop to Nanjing, China Southern with a daily nonstop to Guangzhou, China Airlines of Taiwan daily to Taipei, and Xiamen Airlines sending 3 weekly nonstops to its namesake city. Sichuan Airlines, not part of an alliance, has a 3-per-week service from Chengdu via either Shenyang or Zhengzhou to YVR. Another non-aligned carrier, Beijing Capital Airlines (part of the Hainan Airlines confederation) runs a Vancouver-Qingdao-Hangzhou 3-per-week service, and one of their sister carriers, Hong Kong Airlines, flies low-cost daily nonstops to its namesake city. Hainan Airlines itself is running YVR-Shenzhen nonstops twice weekly from late January 2019 onward. Domestic carrier WestJet has a comprehensive network from YVR, and selectively code-shares with several Asian carriers. Numerous smaller carriers connect the small towns and islands from Victoria all the way up to Yellowknife. While those carriers generally do not offer through-ticketing, connections are convenient without too much extra walking through the terminal. American families may find that fares through YVR are a bargain, and if everyone in your group has a valid U.S. passport, there will be no issues in making connections. Passengers arriving from overseas who have a final destination in Canada are directed up one level and along walkways which give the sense of being in the Western Canadian environment, finally exiting down to ground level between totem poles of greeting and into the large Immigration Hall. This is usually a very busy place, with dozens of passport checkpoints. Waiting times here run as short as 10 minutes but could take up to 90 depending on how many flights have just unloaded, and from where. Baggage claim carrousels sit just beyond the passport check, and wait times to retrieve luggage range from zero to thirty minutes. 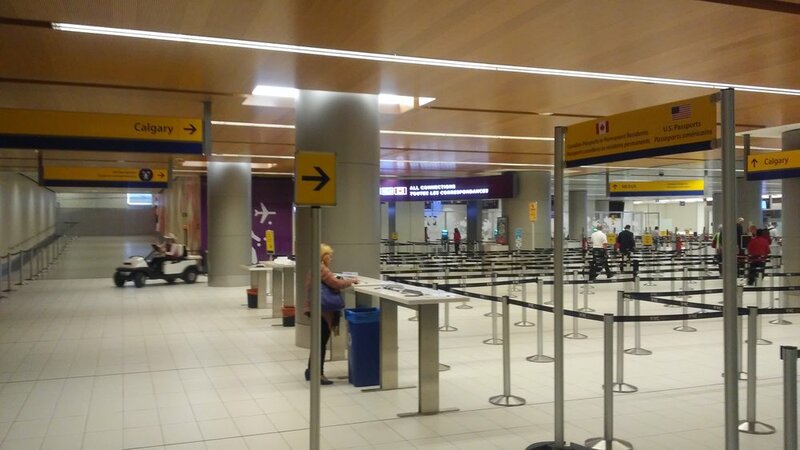 If you’re connecting immediately to a domestic Canadian flight, a security checkpoint for these gates sits on the far right side of the hall. If you’ll be staying in Vancouver, need to check in with a different airline, or just want to step out for fresh air, the exit to the outside is on the left side of the hall. In either case, be sure to have your baggage declaration form completed and ready to hand to an officer as you pass through. If you are connecting to an American destination, follow the signs from your gate to the "USA Connections" facility. There you'll have a security scan and go through U.S. Customs. You won't have to go through customs again when you get to your home airport. YVR is a relatively compact airport, using an octopus-shaped layout. Concourses for US and overseas flights fan out to the north, while domestic concourses spread east and south. Check-in halls, as you approach the terminal by train or road, start with the US transborder desks, then the overseas desks, and finally the domestic desks. Walking times in the complex are reasonable; from international security to the farthest gate can be done in 15-20 minutes; domestic gates are about 20-25 minutes across. Many moving sidewalks have been installed, and hallways on the International side are generously wide. For Americans passing through to Asia, your flights from the U.S. dock in a dedicated area that is glassed off from the rest of the terminal. Follow the "International Connections" signs to a Canadian border station, get your passports checked there, and then enter the International gate area. The “streambed” water feature weaving through the international departure area offers a place for quiet relaxation, although you will have access to it only on your outbound journey. Locally-produced artwork is placed liberally through the terminal; kids will appreciate the variety, scale, and stories behind the pieces. There’s a kids’ play area near gates 53-54 on the international side, and on the domestic side, near gate 43 on Concourse C, and gate 5 on Concourse A.
YVR includes a family/special-needs facility at almost every point where conventional restrooms are located. These are generously-sized for stroller parking, incorporate a large counter for setting bags and changing diapers, and are cleaned frequently. Standard restrooms vary in quality from place to place; the pre-security domestic food court location is very well-appointed, whereas facilities on the international concourses are rather generic. Stall sizes by the international gates are only average, with few options to place your belongings. Cleanliness is average, lighting is adequate, and finding a working faucet or towel dispenser may take a couple tries. he family facilities are highly recommended; use the standard facilities just for your own needs. 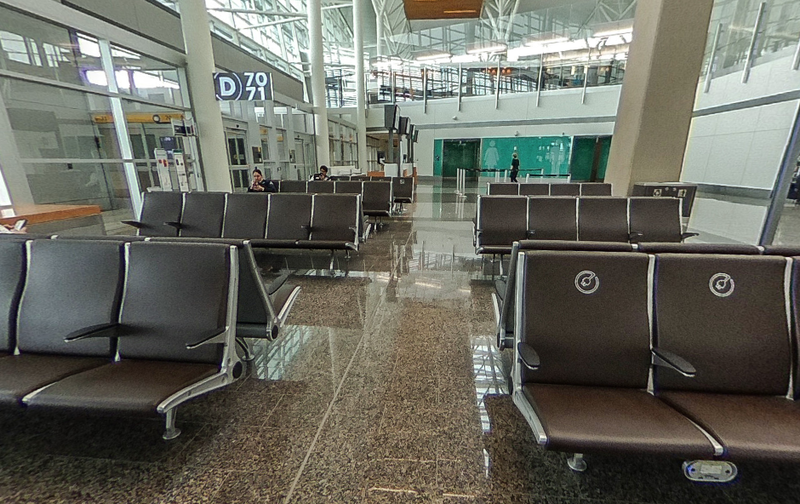 Food courts and sit-down restaurants are liberally placed throughout the Domestic and International terminals and gate areas, both pre- and post-security. Usual chains like Pizza Hut, Wok ‘n Roll, and Starbucks are well-represented, with some local vendors mixed in. Most importantly, Tim Horton’s can be found in multiple locations, including the international gates, so departing and returning families can get their donut fix. Shopping choices are numerous but mostly of the newsstand and souvenir variety. There are a number of shops catering to families both inside and outside the secure zone. Very thoughtfully, a medical clinic and pharmacy is located on the domestic arrivals level; handy for quickly addressing your child’s basic health concerns that may have manifested after leaving Guangzhou. Wi-Fi is free throughout the terminal. Light rail northbound to Downtown on Skytrain’s Canada Line takes about 25 minutes. Connections are available at the Waterfront station to light rail and commuter rail for eastbound suburbs, and by ferry to North Vancouver. The Fairmont Vancouver Airport is certainly the easiest to reach, as it is attached to the main terminal (just east of the U.S. ticket counters). Rates are higher than the off-airport properties but not by much. The historic bridge from the northern tier to East Asia. The connection between the Twin Cities and East Asia goes back to the late 1800s and the days of the railroad barons. When local “Empire Builder” James J. Hill completed his Great Northern and Northern Pacific lines from Minnesota to Seattle, his trans-Pacific steamship line was waiting to provide continuous service to Yokohama and the ports of Cathay. Northwest Airlines - headquartered here - pioneered the “Great Circle Route” from America through Canada and Alaska to Asia during World War II, and pioneered airline service along that corridor after the war. Minnesotan companies like 3M, Cargill, General Mills, and Target built import and export business with Asia; the University of Minnesota and the Mayo Clinic attracted students and clients from across the Pacific; and a steady stream of immigration and overseas adoption has made the Twin Cities into a surprising multicultural home. The Minneapolis-Tokyo route is still flown daily by Northwest’s successor Delta Airlines; the terminus was switched from Narita Airport to the more-conveniently located Haneda Airport, making this flight excellent for family travel to Japan. Delta is starting MSP-Seoul Incheon nonstops in April 2019 and this will allow for excellent connections to all of East and Southeast Asia, exceeding what Delta and Northwest had ever offered over Narita. Delta has also applied for Minneapolis-Shanghai nonstop service to begin in 2020, if approved. MSP is Delta’s 3rd-biggest hub, so same-afternoon connections from the inbound Tokyo and Seoul flights can be made to every large city in the Midwest, Southeast, and Northeast, plus almost every mid-sized community in the North Central states. Even though MSP's Terminal 1 is a very busy facility, when the Asian flights arrive there are usually no other international operations being processed by Customs. As a result, passport checks go quickly; expect a 5-15 minute line. Baggage claim at MSP used to be dreadfully long, but Delta has made steady improvements - domestic luggage is usually coming onto the carrousel by the time you’ve made it off the airplane and down to baggage claim. International passengers should expect to see their bags rolling up about 10 minutes after clearing passport control. If you have nothing to declare, you may proceed directly to the exit area. If you’re connecting to another Delta flight, check your bags at the Delta counter and then go through security screening. You’ll exit directly back onto Concourse G - the same level you arrived on. If you’re using another airline, taking ground transport or being picked up, skip the security check and head downstairs to the exit on the domestic baggage claim level. MSP uses two terminals, spaced several miles apart. Terminal 1 (Lindbergh) is much larger and the home of all Delta and SkyTeam flights, plus United, American, Spirit, Alaska, and Frontier. Terminal 2 (Humphrey) is the home of low-cost carriers Southwest and Sun Country, as well as budget carriers coming over from Europe like Icelandair and Condor - it has its own dedicated Customs operation so as not to interfere with Delta/ Skyteam arrivals at peak times. There is a free subway link between the terminals which is accessed via the parking complexes at each building. As most Asian trips through here will be on Delta, that’s where we focus this article. 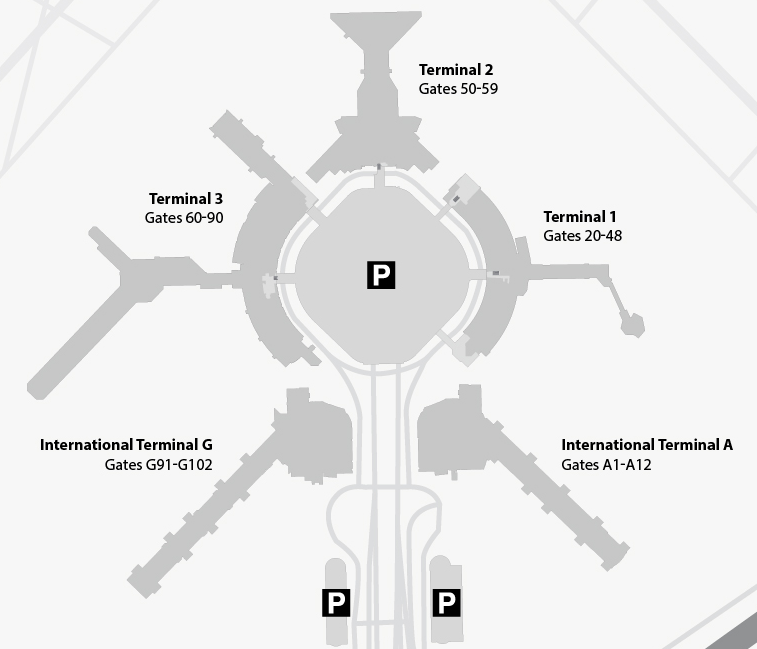 Terminal 1 is H-shaped, with four main piers extending from the central ticketing / shopping / baggage claim complex. The longer concourses (A, B, C, and G) are equipped with moving sidewalks, and there is also a tram running between the A - C - D gate areas. If you are checking in for an international flight, those Delta counters are on the left-hand (western) side of the building. Delta has installed automatic luggage drop centers at the main terminal check-in. these have the potential to significantly speed up the process, especially for traveling families! Delta uses the A, B, C, and D gates mostly for regional aircraft and shorter-haul routes. 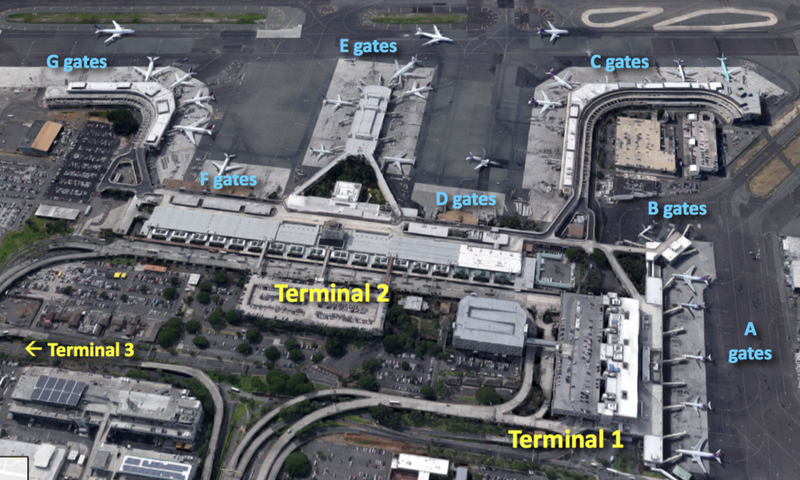 The F and G gates see larger aircraft and longer-haul routes. Gates G1 - G10 can serve long-range international flights; the Tokyo run usually departs from G4. 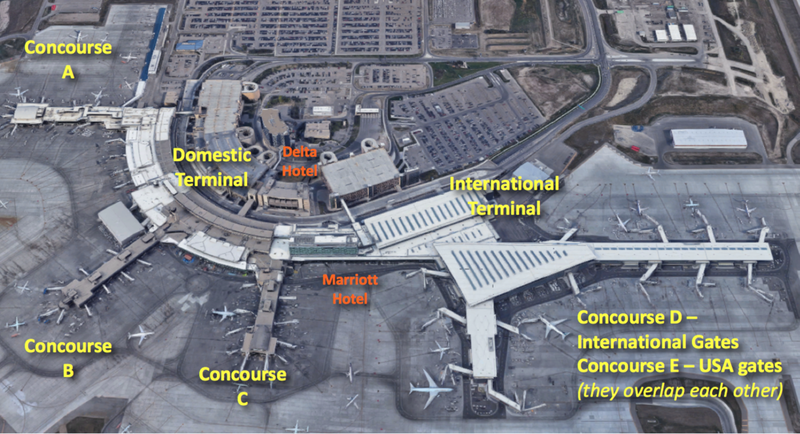 All other Terminal 1 carriers are located on Concourse E. Regional propeller-aircraft flights dock at the far end of Concourse B. In the middle of Concourse C you’ll find a large active play area, where kids can climb, slide, and explore a two-level jetliner. Also near the play area (by gate C22) you’ll find a private nursing-mothers room. And there’s a vending machine for diaper-bag basics next to the play area, too! MSP has sported video-game and pinball arcades since the 1970s and there are three of them operating today - look by gates G7, C1, and F7. There's a small, free movie theater that runs short films near Gate C13, and along the moving sidewalk between gates C7 and C4 there is an art gallery with frequently-changed exhibitions. The Republic bar at the entrance to the D concourse has built a live-music venue that will showcase work by students, faculty, and friends from the Twin Cities' music community. Most local travelers don't know about the open-air “Quiet Seating Area” in the central complex upstairs on the Mezzanine level; a perfect place to close your eyes and get away from crowds between flights. Look for the sign by the entrance to Concourses F.
Another great place to find some peace is off Concourse D, up three flights of stairs to the Observation Deck. You’ll have a panoramic view of the eastern half of the airport and Downtown Minneapolis. There are extra seats here and usually very few travelers. If your kids are a little bit older or fascinated by airplanes, head here between flights. There are five Family facilities in the secure side of Terminal 1 (near gates A6, B11, C16, at the entrance to Concourse E, and F11.) Restrooms throughout Terminal 1 are being progressively remodeled to give more light and less crowding - these upgraded facilities each feature unique and cheerful mosaic artwork at their entrances. Brightly lit and with plenty of room to maneuver around in a heavy coat or with a stroller, these could be some of the best airport restrooms in the country! Stalls are both wider than the ones they replaced and *deeper* which means you can get your roll-aboard suitcase in there with you ... or a stroller... and still have room to take care of business without smashing your knees. They've also added hooks and small shelves inside the stalls to help you keep your gear off the floor. Each of these upgraded restrooms has a changing table, and usually one even-larger stall for wheelchairs or family needs, where it's actually walled-off, not just partitioned-off, for extra privacy. You walk through this market to get to the main International gates in Terminal 1. The open-air market area at the entrance to the G-gates is a particular favorite for families because of its many healthy food options, buffet-style stations, and a self-serve frozen yogurt bar! Wi-Fi is now free at MSP for the first 30 minutes. From the days of sailing ships to the flight of the China Clipper, San Francisco's ports have long been the primary connecting point for passengers and cargo between the USA and Asia. California's Gold Rush of the 1850s and construction of the Transcontinental Railroad were not just logistical drivers that put San Francisco in its hub position, but also the reasons for the initial wave of Chinese immigration to North America. Despite a troubled social and environmental history, Asians stayed in the city, and more waves followed, creating iconic neighborhoods like Chinatown and Japantown in the city proper, and giving the entire Bay Area an exciting and unique cultural mix like nowhere else on Earth. Universities, research centers, military, electronics and Internet industries all promote a trans-Pacific worldview, and school systems in the region routinely teach Asian languages. To Tokyo-Narita, United and ANA-All Nippon each have a daily nonstop. To Tokyo-Haneda, United and Japan Airlines each fly daily. To Osaka-Kansai, United flies nonstop daily. To Seoul-Incheon, there are three daily nonstops; one each on United, Korean Air, and Asiana. To Beijing, United and Air China each have a daily nonstop. To Shanghai-Pudong, China Eastern and United each have a daily nonstop. To Chengdu, in China's western Sichuan Province, United has a 3-times-per-week nonstop. Guangzhou is reached daily by China Southern; 4 flights per week are nonstop, and the other 3 stop in Wuhan, capital of central China's Hubei Province. Hong Kong enjoys twice-daily nonstops on Cathay Pacific, plus a daily nonstop each on United and Singapore Airlines, and new nonstop service on Hong Kong Airlines which started in March 2018. To Taipei, China Airlines and United each offer daily nonstops; EVA Air flies it twice-daily. Manila has a daily nonstop on Philippine Airlines. Singapore is now served nonstop twice daily: one with United and one with Singapore Airlines - and those are mighty long flights, indeed. Additional nonstop service will be added in late 2018. The city is also reached with a one-stop on Singapore Airlines via Hong Kong. For domestic flights, United is by far the dominant carrier at SFO with a full-fledged hub operation with commuter, regional, and transcontinental service; they run all the E and F gates out of Terminal 3 and have a connector to concourse G in the International Terminal so that you do not have to go through another security screening. American, Alaska, and Delta are the next-biggest carriers at SFO, both covering a number of key business destinations and some shuttle services. Southwest, Frontier, JetBlue, and Sun Country cover a narrower set of domestic routes. All flights from Asia arrive at the International Terminal. Star Alliance flights (United, Air China, ANA, EVA Air, Asiana, Singapore) arrive at Concourse G; everyone else arrives on Concourse A. For both concourses, there is a departures level above and an arrivals level below. As you exit your aircraft, ramps will direct you to the ground floor and moving sidewalks will take you to the central Immigration desks. Wait times range between 5 - 30 minutes depending on how many flights are unloading; SFO is usually one of the fastest airports in the country for handling passport control. Your bags should be waiting on the carousels beyond; if you have any goods to declare, stop at the Customs/Inspection counters; if not, you'll leave the hall. Airline counters are just outside to re-check your bags if connecting onward; if the Bay Area is your destination, ground transport including the AirTrain and BART are just outside. After checking your bags, go up one floor to the Ticketing level to move on to your domestic terminal / gate. United is to the left (north) in Terminal 3; Delta on the right (south) for Terminal 1; for American you'll take the AirTrain to Terminal 2. You will have to re-clear security. SFO has been rebuilding the domestic gates and terminal buildings; Terminal 2 / Concourse D (American and Alaska is complete) is all-new. United's complex in Terminal 3 has finished its renovations, and Terminal 1 is well underway. United has the lion's share of domestic-international connections, and their gate setup makes it seamless for travelers to connect; departure areas in concourses E, F, and G are all inside the same security zone. Concourses C (Delta) and D (American, Alaska) are also in a common security zone. Concourse B is mostly Southwest and is in its own security zone - it is undergoing heavy remodeling; Concourse A - in addition to international departures - also houses JetBlue and Sun Country. There are connecting passageways between Terminal 3 - Terminal 2 - Terminal 1, but these are in the public (non-security) zone. It's usually faster to take the AirTrain if you have to get between Terminal 2 and the International Terminal, and while construction on the western end of Terminal 1 is ongoing, there's no walkway to even use - so you'll have to use the AirTrain as well. For local passengers, check-in at the spacious International Terminal is straightforward, with the Star Alliance carriers' counters close to the Concourse G entrance, and the SkyTeam & oneworld carriers concentrated toward the Concourse A entrance. SFO is not just well-known for its extensive art displays and numerous seasonal exhibits throughout the complex, they're an actual, accredited museum, with more than 20 different gallery spaces in the terminals, plus a library, and a full-sized permanent aviation museum in the International Terminal. There are four "Kids' Spots" at SFO - two in Concourse D, one on E, and one on F - each with weather-related science experiment stations, some kind of climbing / crawling apparatus, and spongy flooring to help tykes wiggle out extra energy before flights. On Concourse E by gate 60, also see the "Flight Deck," where a great view of the tarmac is paired with interactive screens teaching about aviation history and the city of San Francisco. Yoga rooms have been set up on Concourses D and E to help you unwind. SFO has self-guided tours / scavenger hunts for kids for each of the three domestic terminal areas, with prizes for completing each course - check with the Information desks for the guides. Drinking fountains on all the concourses have been upgraded to hydration stations, so you can refill your water bottles for free. Perhaps the most AWESOME amenity at SFO is the "Wag Brigade," a group of over 20 specially-trained dogs who are brought all over the terminal complex to help de-stress travelers and bring smiles to kids and grown-ups. Standard mens' and women's restrooms at SFO get a lot of traffic, so be prepared for lines during peak connecting waves. Stall space is at a minimum and would be very cramped with a child; expect one hook but no shelf to keep your bags off the floor. Cleanliness varies with traffic, but we saw frequent cleanings. The fittings and finish in the International area is nicer than the United gates, but overall SFO's restrooms don't stand out one way or the other. At SFO their 'companion care restrooms' are what other airports would label 'family restrooms', meaning the same thing: a good amount of shelf space for changing and keeping bags off the floor; sinks and handles at lower heights; and plenty of maneuvering room. There are 8 of these on the all-new Concourse D; just one each on E and F - and none on B or C, nor on the International wings. While on the International wings you can expect the usual duty-free lineup of luxury brands, perfume, crystals, and leather, on the domestic side you can really see how the airport has brought in local restaurateurs and merchants to give travelers a real sense of being in San Francisco. The only Starbucks outlets are pre-security, and there's only one Burger King; for coffee inside security it's mostly local Peet's, and while you can get burgers, there's an amazing amount of seafood and Asian fare compared to nearly any other airport in the U.S. - and fairly priced, too! Likewise for merchandise, the vendors have been thoughtfully selected and souvenirs are relevant to the city; and there is a good selection of material for kids at bookshops and even clothing stores. The airport's Wi-Fi is strong and free, with no interruptions for commercials. The BART system has a station just outside the International Terminal; trips to downtown are 30 minutes long. BART connects to Caltrain at the Millbrae station for folks heading south. And SamTrans has 24-hour bus service available for all of San Mateo and parts of San Francisco. Several of the hotels on the airport's southern side are immediately across the street from Bayfront Park, which has a nice walking trail and stunning views of the intersecting runways. Honolulu's extensive harborfront and ample resources made it a natural shipping and military hub between North America, Asia, Australia, and the various Pacific island groups. The Polynesian ancestors of today's Native population were the first wave of immigration, but there have been many others from every direction - Chinese, Japanese, Filipino, European / American, and more. As a result, today's Hawaii is a multicultural mix unlike anywhere else, with amazing choice and innovation in art, food, media, and culture. Add the islands' natural beauty and tourism development, and you have ample reason for travelers to come. To Japan, Hawaiian Air reaches Tokyo-Haneda, Tokyo-Narita, and Osaka-Kansai daily, and Sapporo 3 times per week. United runs to Tokyo-Narita daily. United's Star Alliance partner ANA-All Nippon has two daily nonstops to Tokyo-Narita, and a daily run to Tokyo-Haneda. Japan Airlines has three daily nonstops to Tokyo-Narita. China Airlines has a daily nonstop to Tokyo-Narita (continuing on to Taipei). Korean Air has a nonstop to Tokyo-Narita that continues on to Seoul. Budget carrier Air Asia X flies nonstop to Osaka-Kansai four times per week (continuing on to Kuala Lumpur). Another budget carrier, Scoot, also flies four-per-week to Osaka (continuing on to Singapore). Finally, Delta runs twice a day to Tokyo-Narita, and daily to Osaka-Kansai, Fukuoka, and Nagoya. To Korea, Hawaiian Air (daily), Korean Air (1 daily nonstop & 1 daily flight via Tokyo), Korean Air's low-cost subsidiary Jin Air (5/week), and Asiana (5/week) all fly to Seoul-Incheon. To Taiwan, China Airlines has a daily one-stop to Taipei (via Tokyo) as well as two weekly nonstops. To Manila, Philippine Airlines flies nonstop 3 times per week. To Malaysia, Air Asia X offers 4 weekly flights to Kuala Lumpur via Osaka. To Singapore, Scoot runs 4 weekly flights via Osaka. To Shanghai-Pudong, China Eastern flies nonstop 6 times per week. Connecting opportunities exist at all the major Asian hubs above to reach nearly any point in East or Southeast Asia as well as deep within China on a one-stop basis. Within the islands, Hawaiian Air flies the Boeing 717 jetliner on the trunk routes to Hilo, Kona, Kahului, and Lihue on a shuttle basis. Its subsidiary, Ohana, flies the ATR turboprop to Molokai and Lanai, as well as supplementing jet services. Southwest Airlines is expected to begin some level of inter-island service in 2019 to provide some competition to Hawaiian. Mokulele Airlines is the third-level carrier in the state, flying 9-seat Caravan turboprops to smaller airports on Molokai, Maui, and the Big Island. Arriving passengers from international flights from the B, C, and G gates are directed onto buses to the central Customs facility; from the D, E, and F gates directly attached to the terminal, there is a moving walkway. Passport control is handled at a middle level of the building, and then passengers descend to ground level to pick up bags and go through any necessary Customs clearance. On the ground level just past Customs there are baggage and ticketing check-in counters. For connecting flights on Hawaiian Air, their gates are up and to the left; for Mokulele propeller-craft services, catch a bus to the Terminal 3. All other carriers are directly upstairs in Terminal 2. Time to clear immigration and claim bags varies with how many flights are arriving; morning arrivals can take as long as an hour-and-a-half according to the CPB, while afternoon arrivals usually clear in around 20 minutes. HNL is installing automated kiosks for machine-readable passports and this should help cut wait times (as it has in Dallas and other cities). You may also want to sign your family up for the Global Entry program - this gets you all the benefits of the domestic PreCheck security lines but also expedited handling at U.S. Customs. Image composed using Google Maps. For an airport that really isn't all that big, there sure is a lot of walking involved. Travelers coming in from other islands on Mokulele Airlines will arrive at Terminal 3 on the far western end of the complex. Terminal 1 is for the short hops on Hawaiian Airlines (or its partner, Ohana). The long-haul international flights dock at Terminal 2. An important thing to remember is that all the Terminal 2 gates are "common-use", meaning any flight could be assigned to any gate. While United tends to get the G gates and Delta the E gates, "it all depends" day to day, so be sure to check the monitors on your day of flying. Passengers coming in on Mokulele Airlines need to pick up their luggage in Terminal 3, walk outside to a shuttle bus, and take that either to Terminal 1 (if connecting on Hawaiian) or Terminal 2 (for all other airlines), where they'll have to check in and drop bags with their overseas airline - as well as go through agricultural inspection and security screening. Figure on needing at least 90 minutes (probably 120) to connect as buses, airline desks, and TSA lines can't be easily predicted. Hawaiian Air passengers will already be in Terminal 1, with bags checked through and in the secure zone. Passengers from Oahu check in either at Terminal 1 (Hawaiian Air) or the Terminal 2 for all other carriers. Inside the secure zone you may walk anywhere - all three concourses, plus the Inter-Island Terminal. There is an agricultural inspection checkpoint between the Inter-Island Terminal and the concourses, but it takes only a minute (and if you aren't carrying a bag, you're waved through). Easier than walking, however, is the Wiki Wiki Shuttle that runs on a roadway above the terminals. If you are in Terminal 1 and connecting to the G gates - especially - go up to the third floor and take the bus; it will save you almost 20 minutes of walking. The bus also makes intermediate stops. What is really unusual - and that will make mainland travelers unsure if they've made a mistake - is that the walkways from Terminal 2 out to the C and G concourses are not just open-air, but have a roadway running alongside for the Wiki Wiki buses as well as other airport vehicles. Another unexpected but charming difference between HNL and mainland airports is the pair of open-air gardens inside the secure zone; the bigger one set between the E concourse and the food court of Terminal 2, and the smaller between Terminal 1 and the C concourse. There are staircases leading down from the gate level - garden paths and plenty of seating on the ground; birds and wildlife to watch. It's a favorite for airport staff and a unique space where kids can unwind in nature. The far ends of the three concourses have sweeping views of airport activity (there's a military airbase to the west, and hangars directly across the runway) - the G gates used to be called the "Diamond Head concourse" for its great position looking over its namesake mountain and the skyscrapers over Waikiki. There's a third floor - empty save for a United Club and offices - that you can easily get to for space away from crowds and an even better view. Native artwork and cultural items are spread throughout the complex, some small and some taking up entire walls. Often there will be well-written explanations of how items were used and what their significance is - great teaching opportunities that also keep kids' interest. Terminal 1 - as the newest part of the secure area - has functional and relatively clean restrooms, though lacking in space to manage personal baggage. There are family restrooms near Gate E6 on the central concourse and Gate A15 in Terminal 1 - none out on the C or G concourses or in the central Terminal 2 area. There is remarkably little breadth of selection for both food and merchandise at HNL, and the same outlets get repeated several times across the facility. If you like Starbucks or Burger King, or want to shop at a duty-free outlet for luxury goods, you're in luck. There is a small food court in the central part of Terminal 2, plus a small cluster at the entry of the central E concourse. Outside of that the food offerings are scattered, but very few options out on the C and G concourses. Likewise, most of the retail is clustered along the corridor running through Terminal 2, with more shops in the central E concourse and only newsstands on C and G.
There is one bookstore and a couple newsstands with children's materials. Most gift shops have candy, toys, and island souvenirs that kids would appreciate. The "Flight Deck" shops, especially the big one at the entrance to the G concourse, have a nice assortment of model aircraft and aviation-related gifts, both for collectors as well as for kids' play. There is no free WiFi at HNL; ShakaNet charges $6.95 per hour, or use your phone's data plan. Small workstation clusters are available near gates A15, A19, B5, E3, and F2. Some areas where there used to be phone banks (mostly in Terminal 2) have been converted to charging stations, but out on the concourses outlets are few and far between. Honolulu is getting a light-rail system together and the airport is supposed to be connected on it, but that is still years off. There are local and express buses available. Calgary's combination of mountain tourism appeal, its energy and agricultural industries, and its concentration of corporate headquarters give good reasons for Asian business and leisure travelers to come to Alberta, and for local traders and investors to make their way west across the Pacific. But also as long as there has been a Calgary, there has been a Chinese emigre community in Calgary - over 100 years. The Canadian Pacific steamship and rail lines were key to the Asian settlements in Vancouver, and Calgary's position as the next major city east on the C.P.R. also made it a natural place to build new lives. In the current era, Calgary is home to immigrants and students from throughout the Asia-Pacific region. Canada's openness to global trade and immigration - and savvy negotiation of air services treaties - has helped the country become a vital node to the world's economy, so it is not surprising to see Alberta gain Transpacific airline links. Air Canada launched Calgary-Tokyo flights in 2010 with a three-per-week schedule, but thanks to strong demand the frequency was upgraded to daily status in 2012, where it has remained. The late-morning arrival from Tokyo, and early-afternoon departure from YYC, allow ample time for connections with airports in the Prairie provinces. Flights AC 009 / 010 operate with a Boeing 767-300, which has a comfortable and family-friendly 2-3-2 seat arrangement in Economy. Hainan Airlines launched flights from Beijing to Calgary in June 2016. These services run three days per week (every other day) and arrive YYC about 1 pm; departing about 3 pm. The Boeing 787 is used on this route, with a tighter 3-3-3 arrangement in Economy. Calgary is a hub for both Air Canada and WestJet (who is also headquartered there). Both carriers operate competitive networks to all the major Canadian cities and regional centers, using a mix of jet and prop equipment. WestJet is the largest carrier at YYC, offering about 50% more seats than Air Canada; however they do not fly to Asia at this time. 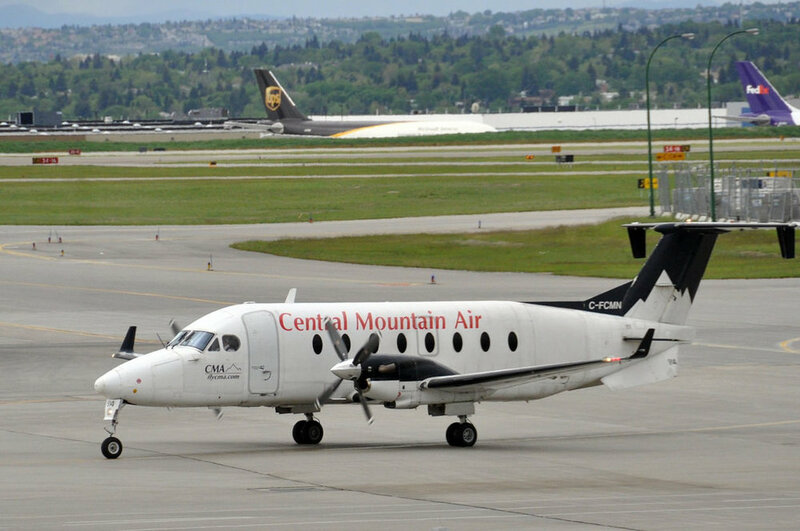 YYC also connects with smaller airports in Alberta, the Yukon, Nunavut, the Northwest Territories, and British Columbia with several independent commuter carriers. After deplaning from an international flight, passengers are routed down to ground level and directed toward the International Terminal. Passengers ticketed for onward domestic flights should look for signage to direct them to the "Connections Centre", because depending on the inbound flight and airline, you may be permitted to go directly to your onward flight without having to reclaim baggage or undergo further screening (check with your airline for details). All other passengers are shunted to the passport control counters and then baggage claim, before exiting to the landslide zone. YYC does offer Automated Border Clearance terminals which may speed the process for families who've signed up. A reviewer on sleepinginairports.net stated, "humongous, well-staffed customs areas make passing the border a breeze." Depending on how many other flights are arriving, wait times for passport check should run 10-20 minutes. Map created with Google Earth photo imagery. Click on image to open airport maps on the YYC website. YYC has a domestic terminal with three concourses: A, B, and C. Concourse A is primarily the gates for WestJet, and the smaller independent carriers. B is split between WestJet and Air Canada, with C dedicated to Air Canada. The A and B gates radiate out of a central security checkpoint, but there is a narrow secure hallway between B and C, and C and D/E. The International D and US-bound E gates sit on top of each other, and are shared across all carriers. The airlines share all these gates, and the assignments change from day to day. You might not know which particular gate your flight is leaving from until the aircraft actually arrives, so the airport would prefer you sit in the concourse's central waiting area (and shop and eat) instead of going directly to the gate. This means you'll need to watch the departure monitors frequently and listen intently for announcements while you're trying to watch your kids. The International terminal is a 5-10 minute walk from the close end of the Domestic Terminal via an enclosed walkway, on both the ticketing and baggage claim levels in the pre-security area, and also via moving sidewalk inside the secure zone. If you have through-ticketing from a connecting domestic flight onto your international departure, you won't need to leave the secure zone to check in at the ticket counters; just proceed directly to the D concourse. Inside the secure zone, there are also "YYC LINK" 10-passenger mini buses that stop at all the concourses, even the International wing. From one side of the airport to the other takes just 5 minutes by this method. There are also two play zones in the US departures gate area, and three in the public (non-secured) parts of the airport. Plus, YYC has placed smaller climbing and play structures throughout the domestic gate areas. Flippers Arcade is an old-fashioned video game lounge on Concourse A; teach your kids how it was done back before we had the Internet and touchscreen phones! The Calgary International SpacePort, at the food court mezzanine level between concourses B and C, (outside security) is a free attraction with flight simulators, real moon rocks, and a big model of the Space Shuttle! It's open 9 am - 9 pm weekdays, and 9 am - 5 pm on weekends. Artwork in a wide variety of media have been placed throughout the airport, from tiny brass fossils in the flooring to giant sculptures in the arrivals hall; unique displays in domestic baggage claim, and even giant cartoony conifers in the International gates. Baby care and private nursing rooms are available next to all the restrooms in the secure side of the International terminal, plus two on domestic concourse A and one on concourse C.
As the International gates were opened in 2016, the restrooms for the D gates are all still quite new and designed with current accessibility standards. Standard restrooms have conventional-sized stalls. For both International and Domestic restroom locations, larger-sized units with locking doors are available for families. Once through security and into the International departures area (Concourse D), you'll have to walk right through the Duty Free Shopping zone. As these are generally luxury items, alcohol, perfume, and the like that you won't be able to consume or use right away, walk right through into the central waiting area. Of interest to families are two candy shops, two newsstand / convenience stores, and the toy shop "Who's Who in the Zoo?," specializing in animals and aviation. In the central area of Concourse D there are also three sit-down restaurants, Thai and Indian food counters, several fast-food locations, and a Starbucks. Back in the domestic secure zone, Concourse A definitely has the most options for fast and fresh food; Concourses B and C have basically Tim Horton's, Starbucks, and Jugo Juice outposts. If you have a lot of time between international and domestic flights, and don't mind going through security again, a meal in the big food court in the landside area between concourses B and C will give far more options. In the same vein, family-interest shopping options are rather scarce on Concourse B and minimal on Concourse C (although there is a "Who's Who in the Zoo" mini location there.) Most of the shopping variety will be found on Concourse A, including another outpost of the "Who's Who" toy shop. YYC is linked to downtown / City Hall with BRT (Bus Rapid Transit) service on route 300. The fare is C$10.50, and it makes 12 intermediate stops. Route 100 is a local bus connecting the airport to the city's northeastern neighborhoods. Route 100 does connect to the CTrain Blue Line for access to the western side of the city via downtown, but there's no speed advantage versus connecting onto Route 300 in downtown. There are plans to extend the Blue Line to the airport, and recent road construction has reserved space to handle the light rail line, but no timetable has been yet set. Wi-Fi is free and fast throughout the airport. For families driving in from more than a few hours' distance, an overnight stay either before or after the trip may make sense to get used to the time change, deal with weather, or just to recharge after the stress of long-distance flying.